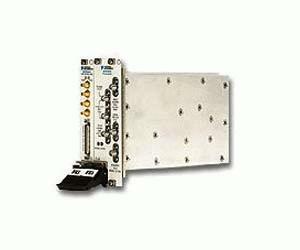 The National Instruments PXI-5670 is a modular 2.7 GHz RF vector signal generator with the power and flexibility needed for use in product development from design through manufacturing. The NI PXI-5670 provides true 16-bit resolution arbitrary waveform generation at 100 MS/s (400 MS/s with interpolation), up to 512 MB of memory, and 20 MHz real-time bandwidth. The PXI-5670 can generate custom and standard modulation formats including AM, FM, PM, ASK, FSK, MSK, GMSK, PSK, QPSK, PAM, and QAM. The NI Modulation Toolkit for LabVIEW accompanies the PXI-5670, providing functions and tools for signal generation, analysis, visualization, and processing of standard and custom digital and analog modulation formats. The combined functionality of the PXI-5670 and the Modulation Toolkit delivers a highly flexible and powerful solution for scientific research, communications, consumer electronics, aerospace/defense, and semiconductor test applications as well as for emerging areas such as software-defined radio, radio-frequency identification (RFID), and wireless sensor networks.